In High Throughput Computing, one is typically faced with having to manage a large set of computational tasks. This can include situations in which tasks may depend on one another. Workflow management systems can help relieve job management burden for you, the user. DAGMan (Directed Acyclic Graph Manager) is a workflow management system based on graphs (see figures below) build into HTCondor. 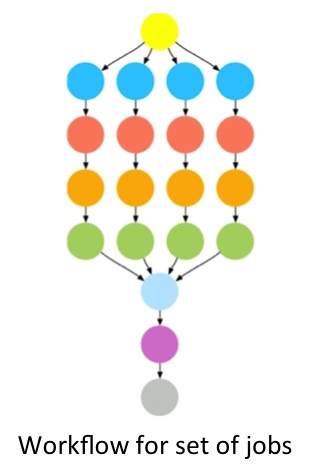 DAGMan handles sets of computational jobs that can be described as a set of nodes in a "directed acyclic graph". 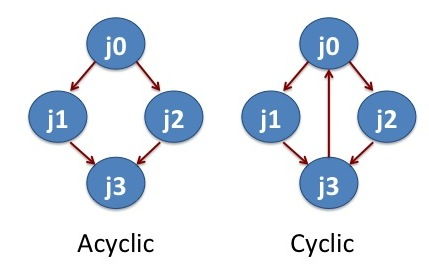 This means that the job dependencies do not form a loop, see "Cyclic" vs. "Acyclic" figure below. In this tutorial, we will learn how to apply DAGMan to help us manage jobs and job interdependencies. First, we will revisit the optimization example from in the previous section. Second, we will manage a set of molecular dynamics (MD) simulations using the NAMD program. NAMD is conventionally used in highly parallel HPC settings, scaling to thousands of cores managed by a single job. One can achieve the same scaling and ease of management in HTC systems using thousands of individual jobs using workflow tools such as DAGMan. DAGMan offers an elegant and simple solution to reduce the management burden on you (the user) if you have more than a handful of jobs to run or there are jobs that dependent on each other. For example, if you have a set of jobs that may take longer than 2-3 hours to complete, a subset of your jobs may be terminated prematurely. Managing the resubmission of prematurely terminated jobs manually is not practical in most cases. DAGMan tracks which jobs were terminated prematurely, and allows you to resubmit the terminated jobs with one command. Similarly, if you have a set of jobs that depend on each other in some way, DAGMan has the functionality to allow you define these dependencies and manage them for you. The first examples, we will revisit the example from the previous section. In this example, we had a job that we first wanted to execute a several times and subsequently with a set of input parameters. The DAGMan script and the necessary files are available to the user by invoking the tutorial command. The directory tutorial-dagman-namd/JobManagementDAG contains all the necessary files. The file jobmanagement.dag is the DAGMan input file. Let us take a look at the DAG file jobmanagement.dag. # OS version, core, and memory, and wants to use the software modules. # Periodically retry the jobs every 60 seconds, up to a maximum of 5 retries. # good approach to periodically release the failed jobs. 1 job(s) submitted to cluster 1317501. We see five running jobs. One is the DAGMan job which manages the execution of jobs inside the DAG. The others are the jobs controlled by the DAG. We need to type Ctrl-C to exit from watch command. Once the DAG completes, the queue will be empty. VARS A0 x_low="-9" x_high="9" y_low="-9" y_high="9"
VARS A1 x_low="-8" x_high="8" y_low="-8" y_high="8"
VARS A2 x_low="-7" x_high="7" y_low="-7" y_high="7"
VARS A3 x_low="-6" x_high="6" y_low="-6" y_high="6"
From jobmanagement.dag, we added four lines starting with the keyword VARS. Each line follows a similar pattern to the job definition line we looked at above: VARS <unique_ID_job> <list_of_variables>. Please note that the variable values have to be in "" independent on whether they are numbers, strings, etc. It is the same as run_job.submit with the added line arguments = $(x_low) $(x_high) $(y_low) $(y_high). 03/08/17 16:25:01 From submit: Submitting job(s). 03/08/17 16:31:12 Node A2 job proc (1178.0.0) completed successfully. 03/08/17 16:31:17 Node A3 job proc (1179.0.0) completed successfully. 03/08/17 16:31:17 All jobs Completed! In the above examples, we use an independent set of jobs. What happens if any of these jobs fail? DAGMan can help with the resubmission of uncompleted portions of a DAG, when one or more nodes result in failure. Retry A2 3 # This means re-try job A2 for three times in case of failures. Retry A2 7 # This means re-try job A2 for up to seven times in case of failures. Retry A3 7 # This means re-try job A3 for up to seven times in case of failures. and HTCondor will automatically detect the rescue DAG and use it to only submit the jobs that have yet to sucessfully complete. One additional feature of DAGMan is that you are able to tune how many total jobs to have sitting in the queue or how fast jobs are submitted to the cluster. This is especially important if you have fairly large number of jobs, i.e. more than 10000. HTCondor can handle up to 200000 jobs in the queue simultaneously, but only on dedicated and specialized hardware. To accomodate other users on the OSG Connect system and reduce stress on the system, we recommend that you keep less than 30000 jobs in the queue in the idle state. In our second example, we will use four MD simulations that have some level of job interdependence. A linear job dependence means that they will be submitted sequentially by HTCondor. For the sake of simplicity, we have artifically reduced the number of computation steps for each simulation. Instead of running the four jobs from the above example independently, we want to run them sequentially, i.e. A0-->A1-->A2-->A3. In these calculations, the output files from the job A0 serves as an input for the job A1 and so forth. These set of jobs clearly represents an acyclic graph. In DAGMan language, job A0 is parent of job A1, job A1 is parent of A2 and job A2 is parent of A3. Let us take a look at the DAG file linear.dag. The file looks similar to the one used for the no dependency example above. The main addition are the last three lines containing the definition of the job interdependency. The PARENT and CHILD commands describes the dependency between jobs, where a job(s) following the PARENT command need to successfully complete before jobs following CHILD command are submitted. Only two jobs are running now: the DAGMan job and the top-level parent, i.e. job A0. A1 through A3 will have to wait until their parent job(s) have completed before the are executed. Sometimes, we need to perform a task before a job is submitted or after it is completed. Such pre-processing and post-processing are handled in DAGMan via SCRIPT command. Now let us see how this work for the linear DAG of NAMD jobs. Except the last four lines block, this DAG file linear-post.dag is same as the previous DAG file linear.dag. The script block specifies a pre script and/or post script and which job they are associated with. The pre script pre-script-temperature.sh sets the temperature for the simulations and it is processed before the job A0. This means the pre script is the first thing processed before any job is submitted. The post script post-script-energy.sh runs after finishing all the simulation jobs A0, A1, A2, and A3. It extracts the energy values from the simulation results. Both pre and post scripts are executed on the local submit machines and not on a remote worker. These scripts should be as lightweight processes as possible. The directory contains the input files, job submission files and execution scripts. What is missing here is the .dag file. See if you can write the DAGfile for this example and submit the job. We consider one more example workflow that allows the cross communication between two parallel pipelines. The jobs A0 and B0 are two independent NAMD simulations. After finishing A0 and B0, we do some analysis with the job X. 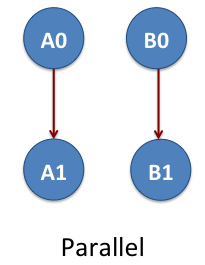 The jobs A1 and B1 are two MD simulations independent of each other. The X job determines what is the simulation temperature of MD simulations A1 and B1. 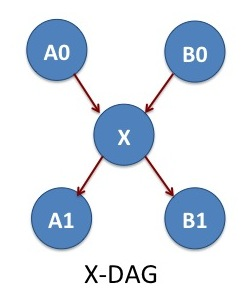 In DAGMan lingo, X is the parent of A1 and B1. Again we are missing the .dag file here. See if you can write the DAG file for this example. Hint: Does the job in the center actually need to do anything (is it a NOOP in programming speak)? Check the DAGMan docs! [x] DAGMan handles computational jobs that are mapped as a directed acyclic graph. [x] condor_submit_dag is the command to submit a DAGMan task. [x] One may write DAGMan files consisting of several DAGMan tasks. This page was updated on Apr 23, 2019 at 11:45 from tutorials/tutorial-dagman-namd/README.md.